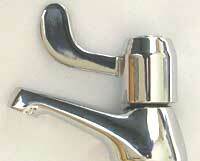 In recent years ceramic taps have appeared on the market. Unlike the older washer type, these taps use two, close fitting, slotted ceramic discs in place of the traditional washers. One of the discs is fixed while the other can be turned by the tap handle through 90 degrees. A pair of ceramic discs are shown to the right with the slots in the aligned/open position. Externally the most obvious feature of ceramic taps is that they are only quarter turn, instead of at least two and a half turns used with washer taps. Internally there is a great difference between washer and ceramic taps. Instead of the washer used in the old type taps, there are two ceramic discs held down over the water supply pipe. The bottom disc is fixed while the upper disc is turned upon it by the tap mechanism thus either aligning the slots (so the tap is on), or blanking the slots (so the tap is off). A body from a ceramic tap is shown to the right. The bottom opening fits over the water supply (with appropriate seals) and the upper (white) ceramic disc is just visible at the bottom of the slot on the side. When the slots in the ceramic discs are aligned, the water flows up through the bottom and out through the side slots (there is another side slot at the back of the picture) into the body of the tap. The quarter turn is normally 'handed' when a pair are purchased - i.e. one tap turns clockwise to open, while the other tap turns anticlockwise. This can take some getting used to. There are a number of advantages with using ceramic discs instead of rubber washers. The main one is that the discs are very hard and withstand the erosion of water very well. With washer taps, both the tap seat and the washer suffer wear, the tap seat by the flow of water and the washer by the actual activity of forcing the washer onto the seat. 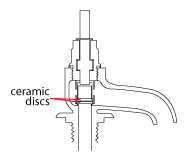 Ceramic discs do wear out and the tap will eventually drip, however replacements are available and (good news) manufacturers seem to be using relatively few sizes as standard. The rotation of the ceramic disc is very low friction (unlike having to screw the washer down onto the seat), in fact, one can literally turn a ceramic tap on or off 'with ones little finger' - this feature is very useful for those with a weak grip, such as the young or old. On the advantage side, they are easy to turn on with the back of the wrist if you have dirt hands or for people with restrictive movement. On the disadvantage side, if you are used to traditional washer taps, you might try to turn the tap handle more vigorously than needed and get a blast of full pressure water. The style of ceramic taps vary from traditional 'cross arms', through shrouded to lever arm (shown right). The 'cross arms' can be confusing, as one seems to expect to fully rotate this style. The lever style are especially useful and easy to use. Plumbing connections to ceramic taps (other than mixer taps which are not covered here) are the same as for traditional taps; sinks and basins using 15mm pipe connectors, bath taps using 22mm pipe connectors.